New River Dining: Vegan dessert: spiced, poached apple with granola and coconut ice-cream. Vegan dessert: spiced, poached apple with granola and coconut ice-cream. Sylviane was on the phone, talking me through the various dietary considerations for the Positive Money group booking in her delightful, slightly halting, Belgian lilt. I'm making notes. "Four vegetarians, four don't mind but Graham can't eat eggs..."
"No problem, I often do split courses." And there it was. Cue the staccato chords in a minor key. The vegans are coming! Vegan kitchen prep. Colourful stuff. incidentally, this is why we can't cater for more than ten guests. See how things are stacked? And this is only part of two courses. I have no problem with vegan cooking... in principle. In practise, my love of butter confounds my good intentions. I cook in a Northern European style. Butter is my default; my go-to grease; my foundation fat. In the end, I had to physically remove the golden stuff, so entrenched are my behaviours. I searched on-line for alternatives, chatting to a fee Twitter friends and vegi-experts: Urvashi Roe and Kerstin Rodgers. The non diary fat of choice seems to be coconut oil. Often seen in hair, or slathered on beach bodies in the 70s - when burning was a badge of honour. Coconut oil does have a flavour. It's not neutral. Mind, neither is butter. It tastes... buttery. Mmm. Coconut oil is pricey, this Waitrose pot was twice the cost of even the best French butter. Actually I do have an issue with vegan and vegetarian cooking, some of it. It's this willingness to try and ape carnivore cuisine. Cooking should be about celebrating your chosen ingredient, not demeaning it with conceit and fakery. Have some pride! You can draw a pig face on a marrow and stick a curly tail at the other end. That won't make it bacon. I've seen vegan lasagne! What's this obsession with appearance? Something with no cheese, white sauce or meat is not lasagne. Make a layered squash bake instead. Good food is honest. I want to make a dish that just happens to be vegetarian or vegan, not one that smugly presents as such, full of moral bombast. I often cook vegetarian dishes; most of my starters are such. But many involve cheese or eggs. Happily I've just started serving a salad of green beans and roasted cauliflower. That was easy to make vegan. Dessert was the problem. No eggs means no rich pastry or lemon tarts, custards, brioche, panna cotta. No diary means no cream, iced or otherwise. Even chocolate is problematic. I couldn't even have honey! Google reveals vegan dessert to typically involve raw fruit or be a butter-less brownie. This may be fine in sunny California, close to the sun baked groves but we were in the midst of the British winter with drizzle and salt strewn roads. There is no good fruit; none at least that hasn't racked up several thousand carbon miles and lost any flavour along the way (it seems). On the night, Drew, one of the vegan diners told me that of his recent conversion, dessert was the most testing time. While others guzzled profiteroles and sticky toffee pudding he was often presented with a plate of insipid orange slices, sometimes drizzled with agave syrup. But in my haste to reach for the exotic, for mango, paw-paw and orange, I'd forgotten the most obvious solution. Yes, there is no good fruit... bar one. The winter apple. There was my dessert. I would repurpose one of my poached pear recipes. An apple is more tender than a pear so some crunch was needed in the final dish. Vegan granola is another easy convert. I replaced the butter with coconut oil. It needs about twice as much oil and you still don't get the snap of the butter stuff. I wonder if simple (and cheap) vegetable shortening wouldn't do a better job? I'll report back. And something sweet and unctuous to compliment the fruit. I had no access to ice-cream, custard, mascarpone, ricotta. Again, I turn to the coconut; its milk rich with fat. With the addition of some thickening corn starch, this can be turned into an excellent... what to call it? Oh, let's roll with 'ice cream'. Many of the vegan recipes for coconut ice-cream seemed excessively sweet to me. Maybe it's because many are American? They do seem to like their sweets... sweet. Ever had key lime or pecan pie?! Wow. I feared the insta-diabetes would send me blind before I could reach for a second helping. The ice cream recipe is simplicity. There are only three ingredients that you boil together. No tricky crème Anglaise base here. You will need an ice-cream maker though. I was very pleased with the final combinations. The spiced syrup made the whole house smell convincingly of Christmas too. Enough to poach ten apples. Scale down for fewer. Stir 600 caster sugar and 200g muscovado sugar into 500ml of water and bring slowly to the boil. While it's heating, add your aromatics: two large cinnamon sticks, a vanilla pod, three cloves, six allspice berries and a single cardamom. I added a good few glugs of an apple liqueur. Maybe use some apple brandy or Calvados? It all helps but it's optional. Hell, everything is optional. You could just eat raw apples. You need to do this in a pan large enough to accommodate all your apples. Something shallow and wide, a very clean frying pan can work. Core and peel the apples. I used fairly sweet Pink Lady. If you're peeling lots, plop them into water with a dash of lemon juice to prevent premature browning. Once the syrup is rolling, add the apples. Careful. They will bob to the surface. Poach for five minutes and then turn them over in the syrup. Another five minutes, then turn again and allow to cool in the syrup. They should be tender but retain their shape. No one wants apple mush. Cover with a lid or a piece of baking paper. OK, you might have noticed these are pears but you get the idea. These can either be eaten cold or popped back into the warmed syrup for another few minutes just before serving. In a bowl, combine: 50g of rolled oats, 25g of bran (breakfast stuff is fine) 40g of malted flour, 50g of crunched up mixed nuts, big pinch of salt and 50g of caster sugar. Mix well. You could add spices or zest at this stage. Perhaps ginger, cinnamon or cloves for a fruit topping. I added a big pinch of ground cloves. Pour over 100g of melted, coconut oil and mix in. Because you needed a picture showing you how to mix stuff in a bowl yeah? Spread the mix in a shallow tray or baking sheet lined with baking paper or silicone and bake at 180°C for fifteen to twenty minutes. The longer: the darker: the more flavour, but be careful not to burn it. Allow to cool and crisp up. Makes enough for ten at least. Take three 400ml tins of coconut milk, the full fat variety. Hey it's vegan, live a little! Add most of the milk to a pan with 250g of caster sugar and heat gently. Add the remaining milk to three level tablespoons of cornflour. 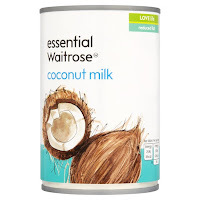 Mix well then add this to the heating milk in the pan. Stir while you bring to the boil. It will thicken considerably. Allow to cool in the fridge overnight or for at least four hours. Churn in your machine. Take the ice cream out of the freezer. You should allow it to defrost for twenty minutes. See the pictures? That's too hard. That's a forearm forge. That's why the balls look like that. Don't do that! Wait for the soft stuff. Take a third of your apple syrup and reduce it to about a third. you want to make a sticky glaze. If you go too far you'll have toffee - delicious but not very useful here. With the back of a spoon, rub some glaze on your plates. This is the glue. Crumble some granola onto the plate; a good thick bed. On this place your cold or warm apple. Ladle more glaze over the fruit and spoon a little more around. Add a scoop (or a quenelle if you're so skilled) of the coconut ice-cream. Garnish with a few blueberries.